As so often happens, I’m taking a leaf out of Leafshine’s book (hah, sorry). 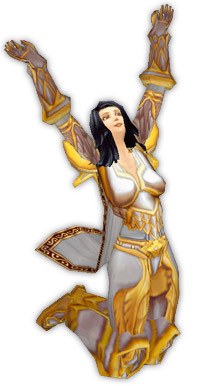 As with so many other WoW blogs, 2008 was the first full year of Banana Shoulders’ existence. I took a long hiatus across May – I posted only six times between mid-April and mid-June – but despite that, traffic numbers returned to their previous levels and grew well beyond them thanks to what I hope, at least, was some useful and relevant content. A lot of my traffic comes from search engine referrals, and as a result my most popular posts tend to be those laden with crunchy data. Still, nothing compares to the sense of achievement when I see someone recommend my blog as a good source of information. On that note – if there’s something you want me to discuss, and I’m not covering it, please ask! 10. Brewfest – Preparing for Achievements (September) 2,600+ views. The timing on Brewfest this year was funny; it was just before we were expecting patch 3.0 to hit, so people knew what the Achievement system involved and were starting to prepare to get as many Achievements as possible. This was basically a complete guide to all the new dailies in patch 2.4, helping people navigate all the confusing daily chains. I really enjoyed the SSO world event, and I hope Blizz does more stuff like this in future. At one point in the WotLK beta, all the skins and facial models for a number of races were changed, and I was one of the first people to present visual examples. (I got bombed with hits from WoWInsider.) Not long after the community started freaking out, Blizz reversed the changes and said they were just testing something (which I still don’t credit). I actually quite liked Sailan 2.0, and I wouldn’t be sad to see those changes introduced for good. The original TBC version of this quick reference sheet was something I put together for my guild to see exactly what I could do (as I was, and still am, our most active jewelcrafter). On impulse I threw it up here on the blog and people loved it, so I felt a WotLK version would be just as useful. Given the plethora of cuts in WotLK, I couldn’t get by without it. This was where I broke the news about the new mechanism for learning Jewelcrafting patterns in WotLK, and it still gets a heck of a lot of google traffic. Now we know how things work it’s not terribly helpful, which is why I wrote yesterday’s guide to the JC dailies. Back when everyone was hungry for glimpses of Northrend, I provided these wallpapers from the beta. Interesting to note how some of the scenery (especially Dalaran) has changed. This is a post I still refer to now; it grew out of me trying to work out which professions gave what benefits in WotLK. I’m glad other people found it useful too. Only posted in December and already it’s in the top ten posts – ah, the mighty Googlepower of gear lists. Not that I wrote it as Google-bait; it was mostly a case of me poring over WoWhead and putting together some gear lists for myself, and then thinking “hang on, I bet other people would find these useful”. Of course, since I hate writing gear lists, it took about three weeks longer than I intended. This is another of those posts that grew out of me working something out for myself. I’d read up on the gearing and mechanical changes fairly early in the piece, but a lot of other people seemed to be confused or misinformed, so I felt a summary and guide to the changes wouldn’t go astray. 1. The Inscription Levelling Guide (September) 14,000+ views. (and in fact the companion posts scored thousands of visits themselves, but I didn’t list them here as that’d make the list rather boring). New content on this kind of scale is tremendously popular, and I’d already seen that with the Jewelcrafting guide I wrote during the TBC beta. At least this time around I knew how best to tackle it! Dropping and relearning Inscription five times got tedious, though. And there you have it; the high points of 2008. I hope I’ve stlll got things left to say in 2009! Come on, someone other than me has to remember Geek Code, that mysterious string of alphanumerics featuring prominently in the .sig files of old-school internet geeks a decade and more ago? Well – and I’m only surprised this hadn’t happened sooner – Typhoon Andrew has come up with a WoW version, a quick and easy way of summing up your WoW focus and interests. …but that’s probably all stuff you knew already. Check out Typhoon Andrew’s original post for a translation, then come tell me what your codes were! I’m curious. Josh of Eye For An Eye has posted an excellent guide to playing Retribution in Wrath – for those of you planning on picking up PvE Ret as your second spec, this is pretty much invaluable, especially if your last experience with Ret was back before Molten Core like mine was. As a counterpart, Ferraro’s blog Paladin Schmaladin provides a good analysis of talents for Ret paladins; if you’re trying to L2Ret, this is a good summary of the decisions you should be making – and the reasons why. On a non-Paladin note, I recently stumbled across Artisan Level, a general WoW and Guild Leading blog that I’m really enjoying; great writing and relevant – if fairly non-specific – content. You can find it at oriniwen.wordpress.com. For the longest time, I thought I hated world PvP, and the idea of a PvP zone in Northrend filled me with ‘meh’. But on a whim I tried a couple of games of Lake Wintergrasp and found I really, really enjoyed it! If you’re interested in checking it out, Mooonfire! has written an excellent guide: “Ten Things I Think You Should Know About Wintergrasp”. It’s definitely worth a read; some Wintergrasp mechanics aren’t at all clear when you first try it out, and a guide like this is a great help. And one last link useful for anyone who’s likely to be tanking – or off-tanking. Honor of Honor’s Code has written a useful guide to tanking caps in WotLK – uncrittability, the block cap, the hit cap and the Expertise cap. Dedicated tankadins probably know all this, but it’s a handy reference for those of us who are, at best, part-time tanks looking to work on our offspec gearing. There are more of you than I expected! Like (almost) every blogger, I eagerly watch my stats to see how my traffic is flowing, to see which posts are more popular and whether my readership is growing or falling. Until recently, though, my feed reader statistics had been relatively low. I just checked again, for the first time in a while, and I have 700 feed subscribers! That’s a lot more than I expected, and I’m very glad people find Banana Shoulders useful or interesting enough to be worth following. Thankyou for reading! I’ll continue to try and be useful and interesting – and if there’s anything you want to see on Banana Shoulders, let me know! Just an offtopic announcement for those of you who frequent the BA chat: the new version of Pidgin, 2.5.0, fixes the problems with joining AIM multi-user chats. Come back, come back, we Adium users miss you! Bre of Gun Lovin’ Dwarf Chick has a very useful list of pre-raid gear guides, by class and spec. She’s kieeping it updated, too. Seri of World of Snarkcraft has a great guide to reputations. It’s aimed at priests, but there’s a very useful roundup of all the major Northrend factions in there as well. Wynthea over at World of Matticus just made a similar post, too, so between those two your rep-guide needs should be covered. Last week, Anna of Too Many Annas posted a great rant about why dual specs aren’t the answer to healer DPS woes. I echo that — when I gripe about holy paladin DPS, people feel compelled to point out that healers shouldn’t be able to do great DPS. All I want, though, is parity with the other freshly-DPS-buffed healing specs. There’s a meme circulating the WoW-blogosphere at the moment: the noble and virile Ratshag, of Need More Rage tagged me to answer: who was the first commenter on your first post? Well, my first commenter was my old friend Leafshine, welcoming me to the ranks of WoW bloggers. It’s his fault that I’m WoW-blogging at all, in fact. Although I love healing, it’s not without its problems and frustrations. This thread on the official forums (relinked from a recent post by Anna) does an excellent job of summarizing the main frustrations of the role. New Blog Recommendation: I’m really enjoying Binary Colors, from a RPing paladin on Feathermoon-US. I don’t RP in-game, although I do think about how in-game events would affect my characters, and I’m a veteran player of pen-and-paper RPGs. Binary Colors is, I’m finding, insightful and interesting and funny. I’d just like to take a moment enthuse about a new podcast on the WoW blogging scene: Twisted Nether. It’s hosted by Fimlys of Asleep at the WoW, and Breana of Gun Lovin’ Dwarf Chick, and it focuses on news from the WoW-o-sphere and the WoW-blog-o-sphere. Fim and Bre are always worth listening to, and in combination they’ve produced a very enjoyable podcast. It’s four episodes in so far, and I’m looking forward to more.